It can be very scary to go through a dental emergency during the middle of the night, on the weekend, during the holidays, or whenever your usual dentist isn’t available, in general. 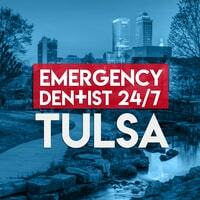 If you need help finding an emergency dentist in Tulsa, we can help. 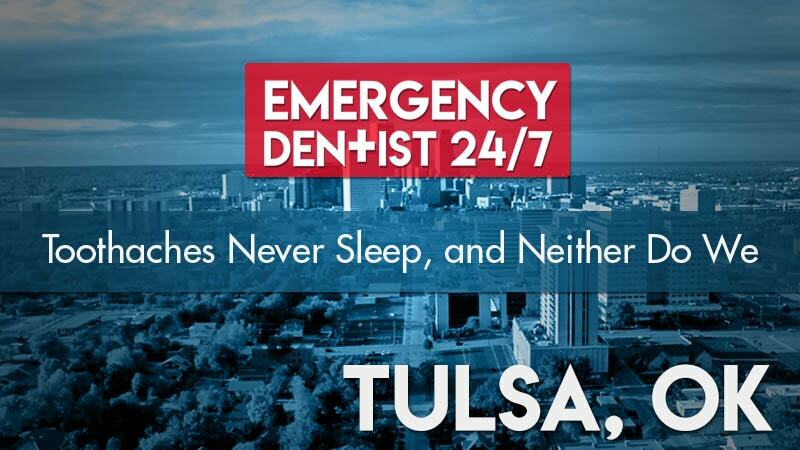 Our 24-hour emergency dentist network helps patients find immediate help from local Tulsa emergency dentists. Call us right now at (855)-352-6790 and we’ll get back to you with a booked appointment in your name in as little as 24 hours. To ensure your appointment goes as smoothly as possible, make sure you arrive at least 15 minutes before your appointment is scheduled to begin. 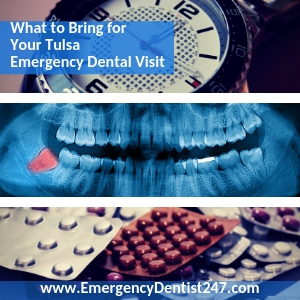 You will need this time to ask any questions you may have, fill out paperwork for your patient profile, and make any concerns or fears you have known to the emergency dentist and their team. Dental emergencies are either the result of an accident or injury, or because an oral health problem went untreated, ignored, or never identified by a dentist. However, regardless of the situation, head trauma must always be assessed and treated before anything else, even if a number of oral injuries are present. Even if you’re panicking over your knocked out and/or lost tooth, the first thing you need to do is ensure you haven’t sustained any head trauma. If you have head trauma, make sure it’s treated and then do your best to find the tooth in question that was lost. Make sure you handle the tooth by crown and never by the root. If you do have to handle the root, which is the part of the tooth that’s not visible in your mouth, make sure you do so as little as possible. 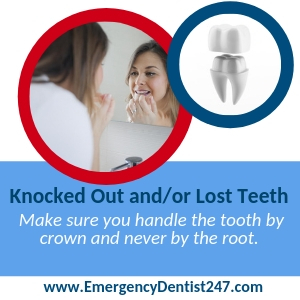 Handling the root too much can destroy that part of the tooth, which will ruin any chance of the emergency dentist being able to successfully implant it back into the empty socket. You can keep it safe by putting it back into the socket temporarily, or by keeping it in a cup of either milk or water. The problem with oral infections is that patients typically don’t realize how serious they are. Any type of infection can grow, fester, and, if left untreated, can be fatal. They can be hard to detect, unfortunately. Most patients don’t know they have one until the pain starts, but there are other ways you can see if you have an oral infection. For example, if you see an abnormal red bump anywhere in your mouth, that may be an oral infection. If you suspect that you have an oral infection, or have any abnormal oral pain, you need to call us as soon as possible. Oral infections are time-sensitive, very painful, and life threatening. Losing a crown or a filling is a lot more serious than patients tend to understand when one is lost. Crowns and fillings are used to protect a tooth from further harm, so you need to act fast to use a temporary protection method until you can get to the emergency dentist appointment we’ve booked for you. If the tooth isn’t protected until your appointment, the emergency dentist may have no choice but to pull it due to additional damage. Dental cement, gauze, and even cotton balls will work. Whatever method you use, make sure you’re consistent and keep the tooth covered. 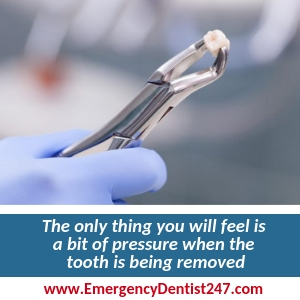 The best way to prepare yourself and get through an emergency tooth extraction if you’re feeling or anxious or scared, is to know a bit about how this process works and what you can expect. You won’t feel any pain, just some minor pressure, thanks to the numbing agent used. The tooth will be removed using a set of dental pliers either whole or by being gently broken up and carefully removed in pieces. After you’ve had a minute or two to relax once the tooth has been removed, you will be given important aftercare instructions to follow at home. These instructions are given to you to ensure you keep the extraction site clean and infection-free. Broken or damaged dentures are just as much of a dental emergency as broken teeth. 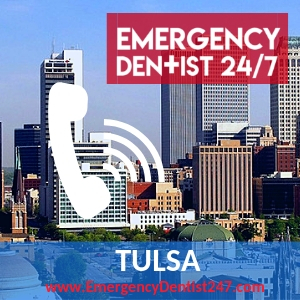 Because of this, we’ve incorporated same day denture repair in Tulsa and emergency denture repair Tulsa services to our emergency referral network. We’ve made this possible due to our adding emergency dentists who work closely with denture lab technicians. This means that, through us, you can now have your dentures fully repaired or go through a full denture fitting in one day, during the appointment we’ve booked for you. More often than not, both an emergency room doctor and an emergency dentist is needed. For example, you’ve been in a car accident that resulted in a concussion and oral injuries. However, as we mentioned earlier, head trauma will always come first on the treatment list. Only an emergency room doctor can treat your head trauma, so you need to go to your local ER for treatment before your oral injuries are treated at the emergency dentist’s. Some emergency rooms have emergency dentist’s on-call, but this is very rare so don’t rely on this. We can book you an appointment with an emergency dentist while you receive treatment for your head trauma, so don’t hesitate to give us a call while at the ER.